Every fall, motorists hit the highways in droves to spy the region’s scenic vistas crowned with fiery tones. One such ribbon of pavement is the Cherohala Skyway, a marvel of engineering that winds, twists, and climbs for a stunning 42 miles between Robbinsville and Tellico Plains, Tennessee. The skyway traverses an area once considered impassable—the high mountains and deep gorges of Cherokee National Forest in Tennessee and the Nantahala National Forest in North Carolina, hence the name Cherohala. The idea for a highway between the two states came about in 1958 during a Tellico Plains Kiwanis Club meeting, when members were pondering ways to boost the remote town’s economy. 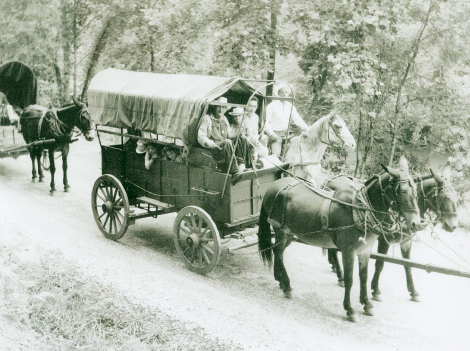 Member Sam Williams jokingly suggested that they might as well use a wagon train since the crooked gravel roads that zigzagged across the mountains were only fit for horse-drawn carts. Six weeks later, Williams led 67 covered wagons and 325 riders on horseback some 40 miles across the steep wilderness to prove the point. It took 12 hours to reach Murphy. The stunt worked. That first train (the treks are now an annual tradition) attracted the attention of media and lawmakers. However, the Cherohala, which was controversial from the beginning, wouldn’t see completion for 38 years. The plan for the initial route from Tellico Plains to Murphy shifted when fund-raising began. Organizers sought federal funding, which can only be spent on federal land, so it was decided that the road would travel through Joyce Kilmer Memorial Forest and end in Robbinsville. Environmental concerns halted the project from 1968 to ’83. An acid leak discovered in 1977 in a rock formation in Tennessee was among the setbacks. Eventually, it was decided the skyway would skirt Joyce Kilmer forest, and construction began in earnest. It took 10 years and a whopping $100 million to build the Cherohala, making it the most expensive highway project ever undertaken in North Carolina. The skyway was dedicated on October 12, 1996, and an estimated 1.25 million motorists enjoyed the scenic route in its first year. The Cherohala, which bypasses four peaks above 5,000 feet and nine peaks above 4,000 feet, still draws some 2,000 visitors each month. National Geographic ranked the skyway as one of the world’s top driving tours, and overlooks offer striking views of the mountains and valleys of Joyce Kilmer forest and the Snowbird and Citico Creek wilderness areas. Much care was taken to protect the surrounding land and wildlife. For instance, to accommodate the endangered Carolina northern flying squirrel, poles have been erected along the skyway to allow safe crossing for the creatures. In recent years, the skyway has become popular with road enthusiasts who appreciate the excitement of maneuvering hairpin curves in a Corvette or on a Harley. But take your time, this route is built for sightseeing.